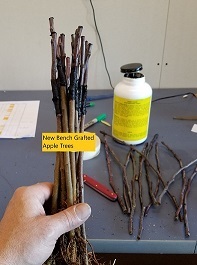 Bench grafting is where you graft a piece of pear scionwood onto a rootstock to grow a new tree. It is carried out in late winter or early spring, using dormant scion wood from a tree of the variety you want to propagate. There are many different methods of bench grafting. At Maple Valley Orchards, we use whip and tongue method which is a good one with high success rates. Bench grafting is where a piece of scionwood is grafted onto a rootstock to grow a new tree. The scionwood dictates the variety of fruit. The rootstock dictates the size, hardiness, vigor, and disease resistance of the tree. Apple scions must be grafted onto apple rootstock, pear scions onto pear rootstock, and plum scions onto stone rootstock. There are many different methods of bench grafting, but the whip and tongue is a good one with high success rates. Basically, we whip and tongue graft a piece of scionwood that has 2-3 buds on it (usually 2-3 inches) onto a rootstock of your choice. Before grafting onto the rootstock, it is cut down to 6 inches above the top root which usually ends up with a 12 inch rootstock. The resulting benchgraft is roughly 14-15 inches long. A large yellow bronze fruit that is fine grained, juicy, and tender. An upright and vigorous grower. Pollinate with any other pear variety. Very large fruit. Should be picked about one week before ripening and then allow to ripen. This is a fair canning pear. A medium sized, green pear with a subacid flavor. Tree is somewhat resistant to fire blight. Moderate keeper. Large red sport of the Bartlett pear with crisp sweet flesh. Has some disease resistance. A Bartlett type pear with a higher sugar content. The skin is very red which makes it a great dessert pear. Pollinator needed. A large green pear with a very rich Bartlett type flavor. Very resistant to fire blight. This is an improved Bartlett pear with the fruit being at least 1/3 larger. The trees are hardy but susceptible to fire blight. Medium size pear with sweet, crisp flesh. Early yellow pear with sweet flesh. Tree is very disease resistant. It is slightly yellowish-green in color with broad areas of dull reddish-brown overtones. This pear, which has a firm but very juicy and sweet flesh, is excellent as a snack or for use in baking.